Parking: Parking requires a National Forest Adventure Pass (Day Use or Annual, available at the Adams Pack Station–if open–and at Chantry Flats or REI). View of parking lot from the Upper Winter Creek Trail. Parking is hard to get on weekends. 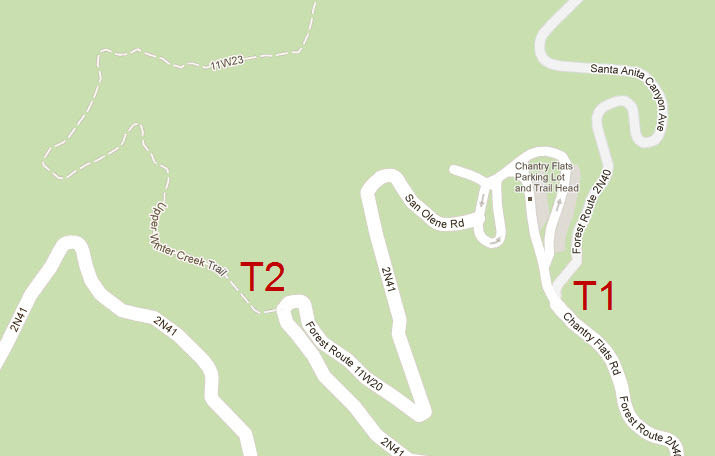 Chantry Flat to Hermit Falls, Sturtevant Falls, and Spruce Grove CG: 9.7 miles, 1970′ of gain and loss. Mt. Zion Loop via Upper Falls and Upper Winter Creek: 9.7 miles, 1980′ of gain and loss. Mt. Zion Loop and Sturtevant Falls via Upper Falls and Lower Winter Creek: 9.8 miles, 2130′ of gain and loss. Mt. Wilson: Gabrieleno Trail, Upper Falls Trail, Sturtevant Trail, Upper Winter Creek Trail Loop: 13.9 miles, 4110′ of gain and loss.